Oh how I love fall. The scents, the cooler temps, the colors, the coziness of it all. I wasn't going to start decorating for Fall until the first weekend in October, but with the temps dropping a little and all of the wonderful inspiration around, I just couldn't help myself. I had to make something for Fall. I dug around in my craft stash and found a few things that got me started on this wreath. This is an image I pinned last year and it is also where I drew my inspiration from for this wreath. In my craft stash I found everything I needed to make this wreath. 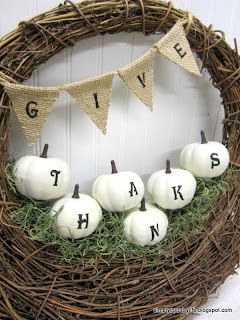 I had 6 faux orange pumpkins, scrap burlap, twine, stencils, paint and a grapevine wreath. First, the orange pumpkins were getting a creamy white makeover to start this project. I removed the brown stems from the pumpkins so that they wouldn't get painted white. I put them back in after the pumpkins were dry. I stuck the pumpkin floral pick stems in styrofoam so that I could spray them from all angles. This took a couple of coats of paint. In between these coats I started making the GIVE burlap pennant banner. I cut a length of twine and also cut four 2" wide by 2 1/2" long triangles out of a manilla file folder to use for the letter pennants. I cut squares of burlap large enough to fold over the twine and cover both sides of the manilla triangles. With spray adhesive glue I attached the burlap to the triangle and them trimmed around it. I did this for each of the four letters. Once the pennant banner was ready and the pumpkins were dry, I painted the letters on using stick on reusable stencils and black acrylic paint. 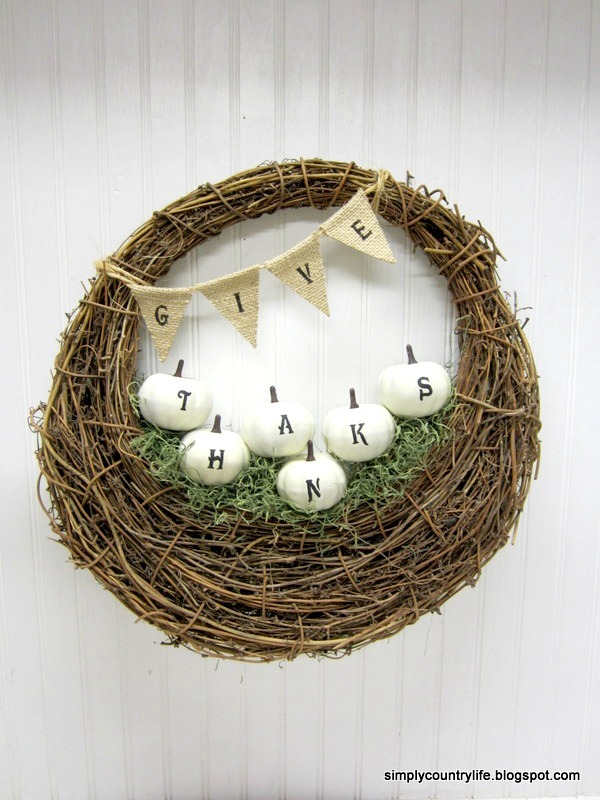 I was stumped at this point because the grapevine wreath I had wasn't large enough to accomodate all of my pumpkins without making the word THANKS look funny. Then I remembered a different grapevine wreath, kindof a basket type, that I had picked up at a yard sale for a buck earlier this summer. It was larger and because it had an open basket type bottom, it worked great! I tied the twine ends from the pennant around the top part of the wreath and started arranging the pumpkins on the bottom part. I used the stems to weave through the grapevine to hold them in place. The wreath looked a little bare at this point, so I added fall leaves and didn't like them and started looking for something else. That's when I found some preserved green moss. I placed it around the pumpkins and I think it was the finishing touch that the wreath needed. It kept it neutral, but added a little pop. I'm thinking I'm liking the white pumpkins this year. What about you, do you prefer orange or white? Thank you for the compliment and for pinning! This just turned out so sweet! Thanks for sharing! I LOVE your fall wreath- the white pumpkins mixed with the light burlap and grapevine is sooo pretty!! It would be awesome if you were willing to share this at the Fall Get Your DIY On Link Party: Fall Wreaths going on right now on five blogs! I would love to invite you over to the happy housie to link up if you haven't already done so! Hope to see you there!! 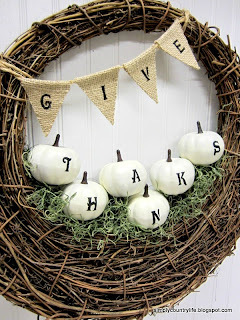 Love your wreath ~ those little white pumpkins are adorable! Super cute wreath! Love the basket type wreath too! Thanks for the inspiration! Loving those white pumpkins! Great call on painting them white!! 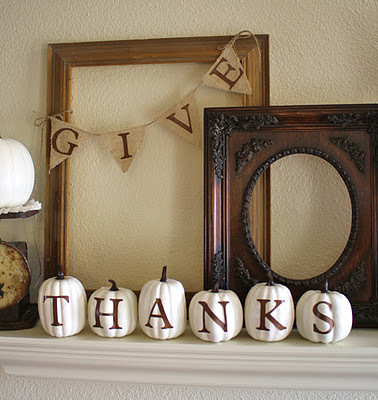 Super cute :) Thank you so much for linking up your fall inspired wreath Get Your DIY On. 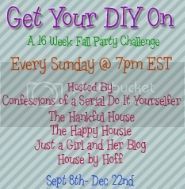 I hope you'll join us tomorrow with your thrifty upcycle to link up!! I love this pretty fall wreath! It's so simple and stylish! 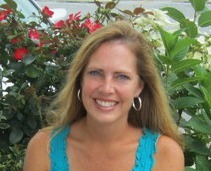 Thanks for sharing this at The Pin Junkie Link Party! It was featured in a collection of fall decorating ideas. http://www.thepinjunkie.com/2013/11/fall-decorating-roundup.html. Make sure to link up your fall recipes at Friday's party!